The Mazda MX-5 Spyder has a low-slung roofline, which Mazda says is done without sacrificing interior headroom. LAS VEGAS -- Mazda rolled out two creations for the Specialty Equipment Market Association show here last week: a sporty interpretation of its MX-5 Miata roadster and a more powerful Mazda2 subcompact. 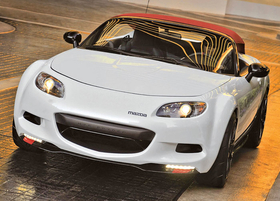 The MX-5 Spyder is a collaboration between Mazda North American Operations' design team and Magna Car Top Systems. The soft-top treatment gives the Spyder a low-slung roofline, which Mazda says is done without sacrificing interior headroom. The red top contrasts nicely with the Stratosphere White paint job and the gun-metal wheels with high-performance Yokohama tires. The interior has black leather seats with aqua accents and ash-hued inserts and is finished off with silk gray metallic trim pieces throughout. Power continues to come from the MZR 2.0-liter four-cylinder engine, but it's not without a twist. The engine runs on BP's isobutanol biofuel, which also was used in Mazda's Dyson Racing LMP entry in the American Le Mans Series. The subcompact Mazda2 gets more roar from a 2.3-liter, 263-hp turbocharged four-cylinder engine. Helping to control all of the power is a beefed-up suspension system, anti-roll bars and front Brembo brakes. The package rides on black 17-inch OZ Racing wheels. The turbocharged Mazda2 has a white paint job with brilliant black lower panels, wheel arches, side skirts and lower front fascia and bright green and neon yellow graphics. The cabin has black leather seats with yellow leather inserts and seat piping.